So many people eat on a cruise ship at every meal that the main dining halls have staggered eating times. Menus at both buffets and à la carte restaurants can be complex and elaborate. Ensuring that every guest is served within a decent time frame can be stressful. It is here that proper planning plays a key role in service for rush hour. Cruise ship chefs begin prepping meals the previous day. It begins with a look through the menu to understand the requirements of all the meals that will be served. This includes all the dishes – from salads to desserts, beverages and cocktails. Estimates are made of the number of dishes expected to be ordered and a requisition form is sent to the provisions staff. This form includes every ingredient required for the next day’s meal. The provisions team ensures that all of these ingredients are readily available for the cruise ship chef the next day. Preparations for rush hour begin early. Often, this can mean turning up at 4am for a 6am breakfast. Breads, donuts, pastries and other items are quickly put together and sent into the ovens to bake in batches. Meats or vegetables that need marination are set aside in the mixture and refrigerated until required. Preparations for peak hour also include cruise ship chefs taking care of salad dressings, roux, meat gravies, coulis, jus and other accompaniments to main dishes. This way, when the time comes, they can concentrate on making fewer elements of the entire dish and simply ladle the accompaniments on quickly. In this case, labels are very important. As soon as something is prepped, it goes into an appropriate container or bag and labelled with a name or description and the date or time. This helps cruise ship chefs know if something has been freshly prepared or it has gone past its use by date or time and could pose health risks if used. If possible, best-selling items in each kitchen are prepared ahead of time to avoid any backlogs during rush hour. These could be certain items that the cruise ship has recorded as popular fare among its passengers over time. Special orders are significant as they are out of the way but need to be made with extra focus and attention. These include meals for those with allergies and other dietary restrictions for health, religious or lifestyle reasons. It helps greatly when special orders or restrictions come in ahead of time so cruise ship chefs can prepare early, sometimes making a meal off menu for the guest. If not, you must be prepared to rustle up something delicious on the go. Preparing for rush hour on a cruise ship is like strategising a military operation. With key components in place and everyone doing their job with full attention and focus, it is possible to serve every guest to their full satisfaction. 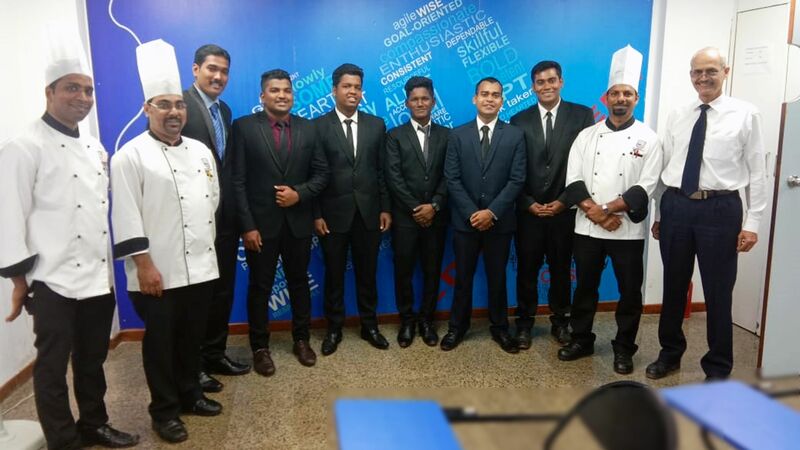 This entry was posted in Chef Jobs, Cruise Life, Cruise Ship Jobs, The Galley and tagged accla, ACCLAindia, cruise chef, cruise line chef, Cruise ship job, survive first contract on March 30, 2019 by admin. Life as a cruise ship chef often receives criticism. No doubt it is tough and requires long working hours, but the take-aways in terms of skills and experience are immeasurable. Hundreds work as cruise ship chefs but not all are able to leave their mark and stand out. It may not be easy, but following a few basic habits can help you leave your mark as a cruise ship chef to get promotions within the cruise industry or recommendations for when you leave. The pressures of work can take their toll on anyone. It can lead to mistakes, which are understandable; but it can also lead to employees losing their cool with others. Never pick fights, engage in discriminatory behaviour or do anything illegal. These activities will go on record and could affect your next job application. Keeping a clean slate will get you top employee ratings. Thousands of dishes are cooked, plated and served at every meal on a cruise ship. Chefs need to know exactly how they must taste and what they need to look like to maintain consistency. It is important to follow instructions so you can help the food and beverage team with their goals. 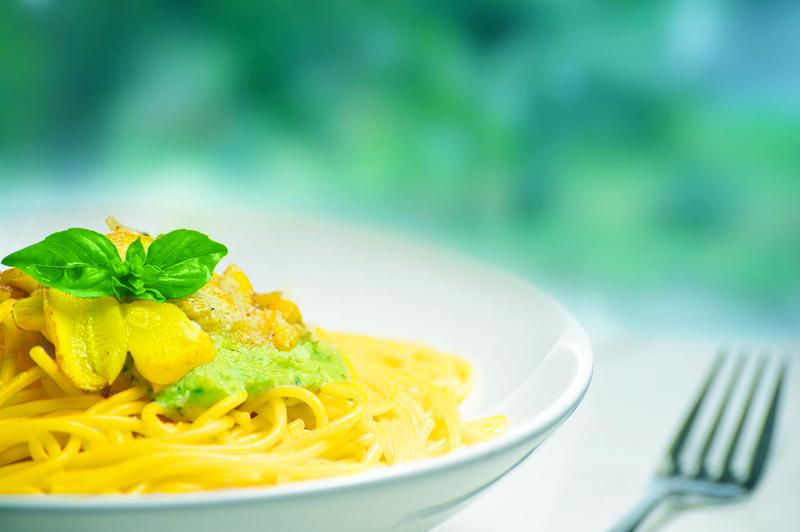 Consistency in quality of cooking, and particularly plating, is always noticed. Following instructions, however, does not mean you cannot be creative or innovative. If you find something that can be improved or changed, bring it to the notice of your superiors. Good suggestions are welcomed, and although they may not always be implemented due to logistical or technical reasons, they will be noted. These could go on your record when you ask for recommendations for another job application. On cruise ships, hygiene is of utmost importance. Being noted for your strict adherence to hygiene standards will bring you recognition. Make sure you wash your hands often and correctly, keep your uniform spotless, and keep your nails trimmed at all times. Ensuring you stay healthy and fit also works to your advantage. It might be difficult to exercise when you have long hours, but putting in 20 minutes a day with a well-balanced diet can help a great deal. This shows the company that you are less likely to be a health liability. Being able to work well with others is always an advantage. When superiors note that you keep team spirits up, can be counted on to take the lead in stressful situations, and maintain composure during crises, they are more likely to promote you. If others take the lead, make sure you do everything you can to achieve the goal. Coordinate with other members on your team, help those who might need a hand, and ask for help if you feel things are sliding on your end. The main aim is always achieving the collective goal. In addition, sticking to general rules of hygiene and discipline always help when making your mark as a cruise ship chef. This entry was posted in Chef Jobs, Cruise Life, The Galley and tagged accla, cruise chef on March 18, 2019 by admin. Passion and creativity go hand-in-hand for chefs jobs. But with thousands in the fray, it becomes increasingly important to stand out at work. Knowing the basics may not be enough as you grow in the industry; you will need to up your game by making your dish exciting and appealing. One of the main ways to create a new dish or make an existing dish exciting is to eat. Eat the dish you’re looking at changing and also other food, particularly those you are unfamiliar with. This will help you understand flavour profiles and expand your range. It will also give you the chance to pick up on tiny details of the dish and give you ideas for elements to change. You will be able to create interesting new pairings, or even swap a small element in an existing dish to completely change the flavours. Another way to change a regular dish is to play with existing elements. Often, young students follow the book to the ‘T’, making sure every step of a recipe is followed through thoroughly. At a later stage in one’s career, you can look at taking your favourite dish that you have made beautifully for years, and switching it up. This can be done by playing with elements such as textures, plating and portion sizes. You could take a curry and carb dish and make it exciting by introducing a crunchy element. You may not need to change the flavour, but just changing the texture can make the dish exciting. For example, instead of regular steamed rice, you could use rice crackers. Or instead of a boiled vegetable, you could use a purée. Guests are becoming more adventurous with food, even on cruise ships. Watching food shows and reality TV contests can give you ideas of how to hero one ingredient on the plate and complement it with simple additions. Perhaps you could put the focus on beef or mushrooms and use even items like coffee or chocolate unusually in a savoury dish. The flavour changes can be subtle, but even so can make a dish different and interesting. Talk to other chefs about ideas for your dish. You might find that a little tweak to an original idea could make it even more interesting. You can bounce off ideas for flavour combinations, thematic interpretations, and even presentation. Finally, plating can be as important as the dish itself. A poorly presented dish will not be appetising to look at, thereby ruining the experience of the diner before he or she even puts a morsel in his or her mouth. Plating is so important that when chefs are developing new dishes they sketch out several potential designs of presentations before the dish even comes into being. The kind of serving dishes, their size, shape and colour can make a difference too. Placement of the various elements on the plate is important as well, focusing on which ones the diner is likely to eat together. Remember to pay attention to detail. Contrast colours of vegetables and meat, use long elements to create the illusion of height and create beautiful designs using sauces. Gorgeous and technically difficult garnishes are also a great way to catch your diner’s eyes. Meshes, chocolate shards, edible flowers and other similar elements can add an interesting component to your dish. This entry was posted in Chef Jobs, Cuisine, The Galley and tagged accla, cruise chef, Cruise Culinary, cruise culinary trends, Exciting Dish on January 5, 2019 by admin. The holidays are a time of joy and quality time with family. Unfortunately, this means that cruise ship chefs’ jobs get more demanding as they prepare to serve and feed thousands of guests with special Christmas treats during the season. Cruise ships around the world offer a variety of Christmas dishes based on the demography of the guests. However, Western Christmas traditions have become popular across the board, and with a large percentage of cruise-goers coming from these countries, these dishes are a must-have at any Christmas cruise buffet. The ideal Christmas turkey is a skin-on bird cooked slowly in the oven over two hours. It is often stuffed with herbs and nuts and is served with a lush gravy thickened with heavy cream and stock. Cruise ship chefs dress dozens of turkeys over the Christmas season to give guests a taste of home on holiday. Contrary to its name, mince pies are, in fact, a sweet treat. Originally from Britain, they are small, individual pastry cases filled with a chunky dried fruit and spices mix. Cruise ship chefs often add alcohol to the mix, and focus on preparing the perfect pastry to go with it. The tradition of the yule log cake came from a special log of wood saved to be burnt in the hearth over the 12 days of Christmas. Today, to represent this, a chocolate yule log is made or genoise or basic sponge in a Swiss roll tin, and covered in ganache, buttercream and other icings. Cruise ship chefs make these particularly for guests from Belgium, France, Switzerland, and Quebec. Gingerbread has long been associated with Christmas. It possibly came about as a medicinal remedy for over-eating that was common during the festive days. Gingerbread houses were thought to be created around the time the story of Hansel and Gretel became popular in Germany. Today, it is an interactive activity for families, and cruise companies like Disney even have competitions between their ships for the best gingerbread house display. Eggnog was a drink favoured by the aristocracy as milk, eggs and good alcohol were expensive. It is traditionally drunk in Britain and north America over the Christmas period, and can even be sold commercially in tetra packs. On board cruise liners, chefs make eggnog from scratch, using high quality milk, cream, sugar, whipped egg whites, egg yolks and spirits such as brandy, rum, whisky or bourbon. Christmas pudding is a must-have over the holiday season in the UK and Ireland, and is quite common on cruise ships popular with these nationalities. The rich, boozy dessert, also known as plum pudding, contains a mixture of dried fruits and suet with treacle or molasses and flavoured often by cinnamon, nutmeg, cloves, ginger and other spices. Given that the fruit must soak in alcohol over time, cruise ship chefs must begin preparations months ahead of time. Also called glühwein, mulled wine is popular in Scandinavian countries, but is slowly gaining popularity across Europe. It is a spiced liquor often flavoured with orange peel, cardamom, ginger, cloves and cinnamon. Ham is a beautiful addition to any Christmas spread. It denotes prosperity and success, and along with roast turkey, offers an excellent dish as a table centrepiece. Flavoured simply with honey or maple syrup and sometimes cloves, the whole leg of ham is cooked slowly in an oven for more than an hour. It is sometimes glazed with orange-cranberry sauce. Christmas sugar cookies are a classic treat that cruise ship chefs use to their advantage. They are a popular way of getting interactive with guests, by offering demo baking classes and cookie decorating sessions with children. The holiday season for centuries has been associated with Christmas and New Year in the northern hemisphere – lots of snow, fires burning, brandy and rum-based drinks, and everyone covered in furs. For many, the temptation to indulge in all of these Christmas memories in fine summery weather is too hard to resist. Their solution – a Christmas cruise. For the West, the holiday season has been highly commercialized and cruise ship companies have seized the opportunity to cash in on this potential. Swarms of people opt to spend their vacations with family on board a cruise ship in more tropical locations such as the Caribbean, the Bahamas, Mexico, the Canary Islands, and perhaps further in the southern hemisphere in places like Australia and New Zealand. For cruise ship chefs, this means more work than usual, as people tend to indulge themselves far more over the winter holidays than they might do even on a regular cruise. Cruise ships begin by taking stock of ingredients and ordering sufficient supplies, particularly of holiday specials such as turkeys, fruit and vegetable for pies, geese, and beverages including wines, brandy and rum. Preparation for dishes that need time to cure such as ham, or to soak such as dried fruit for Christmas cake and pudding starts well ahead of the season. Cruise companies also analyse their guest lists and understand the demographics – such as predominant age groups or cultures – to design menus that will cater to their preferences. With this in mind, cruise ship chefs jobs entail an understanding of various cultures and their specific Christmas specials. Guests from North America typically enjoy gingerbread, fruit pies, Christmas ham, roast turkey, and fruit cake. 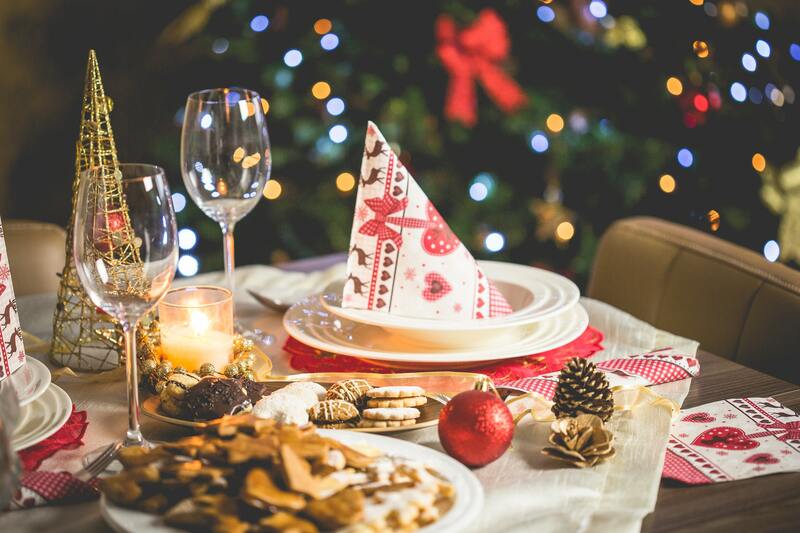 Passengers hailing from European countries such as Germany, France and Scandinavia prefer stollen, mulled wine, Christmas cookies, herring salad, sausages, smoked salmon, roast chicken, spice cookies, meatballs, cheeses and rice puddings. 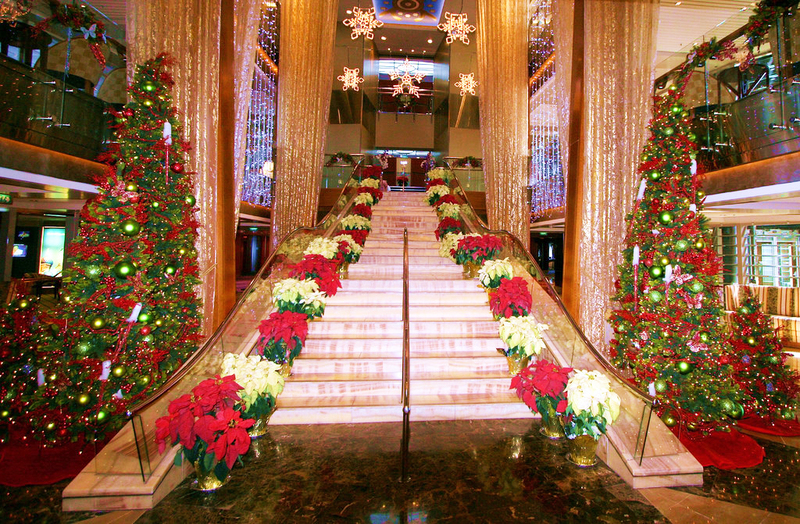 Thanks to the rush over the holidays, cruise ship chefs must cook holiday specials in mammoth proportions. A major part of the decorations are gingerbread displays, which some cruise vessels go to great lengths in terms of size and detail. Disney Cruise Line organises an annual competition among its ships for the best gingerbread house. In 2017, Disney Wonder created a magnificent display made with around 650 pounds of gingerbread dough, 220 pounds of icing sugar and 5250 gingerbread bricks, in addition to candies, cookies and other decorations. Through the season, cruise ship chefs stay busy catering to passengers’ mammoth appetites for holiday specialties. P&O cruise ship chefs, for example, roast around 1100 turkeys and serve 600 bottles of Champagne. On Fred Olsen Cruise Lines, nearly 14000 mince pies and 744 Christmas puddings make their way out of the galleys, as well as nearly three-quarters of a tonne of turkey! On the Silversea, chefs must prepare for guests who typically eat their way through a tonne of turkey and 2200 Christmas pantone, 2500 bottles of Champagne and 12000 bottles of vintage wine. Fruit and vegetable sculptors and cruise ship chefs pull out all the stops on Christmas Eve, Christmas Day and New Year in particular, to create intricate as well as tempting displays of food at gala nights and buffets. In addition, they must prepare special gift baskets and hampers for the shops, bakeries and on board Christmas markets, as well as special trays of treats to be sent to the suites during the holiday season. Cruise ships are getting increasingly innovative, even during Christmas, with many looking at interactive sessions for chefs with guests including demonstrations or classes on making Christmas sweets and puddings, and cookie decorating for children. Being the holiday season, work becomes even more hectic for cruise ship chefs as they put in extra hours to keep up with the high demand and extra trimmings. This entry was posted in Chef Jobs, Cruise Life on December 19, 2018 by admin. For most of human history, cooking has been viewed as a necessary skill, without which humans are resigned to be foragers and hunters. Over the years, with the opulence of empires and their show of wealth, cooking transcended that realm into something of extravagance and show. From basic food forms like pies and roasts, food became more dainty and sophisticated to include newer creations such as bruschetta and salads. More recently, cooking and its final products have focused on technique, appearance and quality, causing many to refer to this skill as culinary art. Art is loosely defined as visual, auditory and performing artifacts that express the author’s imaginative, conceptual idea, or technical skill intended to be appreciated for their beauty or emotional power. Much of this can be applied to the culinary arts. 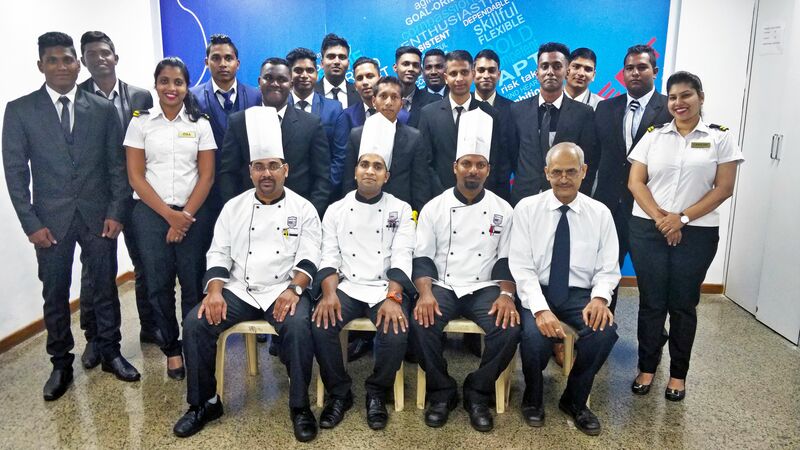 People in the world of culinary arts, including cruise ship chefs, are expected to have in-depth knowledge of food science, nutrition and diet. Students are taught this art just as one would painting or sculpture – including its history, specific techniques and creative expression. By nature, an artist uses a blank canvas to stimulate the senses. Cooking a dish and its presentation can cause similar effects. Heston Blumenthal, for example, created a stunning dessert out of something quite classic. He turned the favourite Italian dessert tiramisu into a potted plant. The dessert is served in a clean pot and appears to be a sapling planted in a soil. To the eye, soil is hardly appetising, initiating a tasteless, bitter, perhaps even unsavoury effect. In this way, it stimulates the eyes and the imagination. Once the diner comes closer, the aroma of the chocolate soil and the mint or basil plant stimulates the olfactory senses. This changes the diner’s approach to the dish, inviting him or her to try it. Finally, the taste buds are stimulated and the diner feels comfort from tasting something familiar, joy at having overcome the initial reaction and from the pleasant surprise. Art can be constituted as a reaction or a relationship between the viewer and the object or experience. A similar example in the modern art space is of Thai artist Rirkrit Tiravanija, whose early installations in the 1990s sought to bring people together by cooking meals such as pad thai and Thai green curry for visitors. This may not be culinary art but shows that art is simply a sensory effect on its audience. They may not perceive it as beautiful or – in the case of culinary art – delicious, but that is their perception of the creator’s vision. 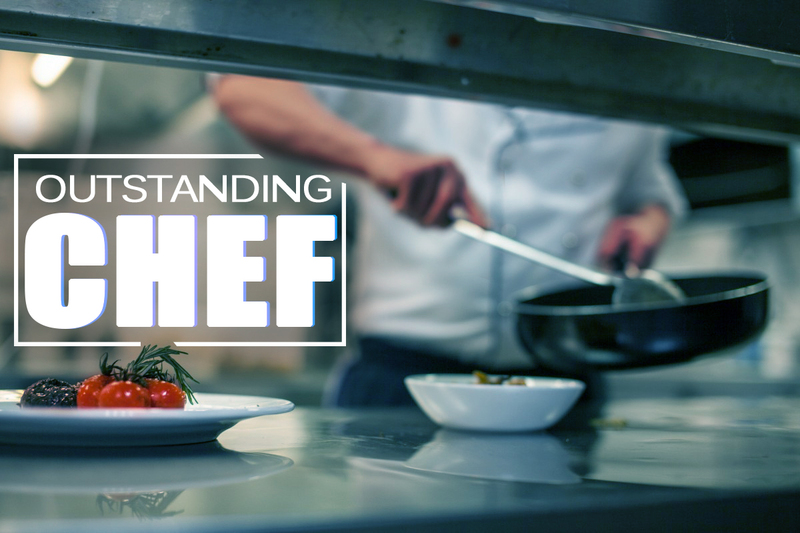 Culinary artists undergo years of rigorous training in skills, food safety, the understanding of chemistry and thermodynamics, and more, to give them a firm foundation of how ingredients react with each other and the elements around them. The creativity rests on their own imagination to design dishes that evoke positive sensory responses from diners so that people keep coming back for more. For cruise ship chefs, their jobs on board may not give them the full freedom to practice their creativity, particularly lower down in the hierarchy, but in celebrity kitchens or once they climb the ladder, the world is their oyster. This entry was posted in Chef Jobs, Cruise Life, Cruise Ship Jobs, Cuisine, The Galley and tagged accla, ACCLA India, cruise chef, Cruise Cuisine, cuisine on December 15, 2018 by admin. Food is one of the most important elements of a cruise. Today’s cruise ship chefs jobs place exacting demands for technical know how and knowledge of varying cuisines to suit almost every taste preference. Two trendy cuisine styles that are catching on in cruising today are haute cuisine and fusion cuisine. The French have always been known for their cuisine, but this fame really began in the 17th century. Before this time, France was simply learning more about food ingredients brought in from its conquests and the newly discovered Americas. A good meal at this time was considered to be one with huge portions, with one record showing about 66 turkeys at a single dinner. Haute cuisine can be considered to have been invented with the appointment of Marie-Antoine Carême – later called the father of French cuisine – as the head chef of English King George IV. Carême was famous for his excessively rich dishes, elaborate decorative edible centrepieces, and also his books on cooking. He took his ideas from La Varenne, who was the first to make roux, and individual or single portion pastries and pies. He set the stage for the reign of French chefs, followed by Georges Auguste Escoffier in the 19th century, who modernised haute cuisine into what it is today. Instead of the elaborate feasts of old, he worked with Carême’s decadent sauces and other culinary concepts to focus on smaller portions using high quality ingredients and precision. Haute cuisine changed the way food was served – from bringing in all dishes at once, to service in courses. The legendary French meal consists of up to 17 courses, from hors d’oeuvres to cold cuts to cheese boards. Haute cuisine continues to follow these practices, with one of its main contributions to the art of cooking being efficiency. Escoffier created the system of dedicated stations for various elements of a dish – soups, sauces, starches and vegetables, grills and fried items, and pastry dishes. This system is still in use today. 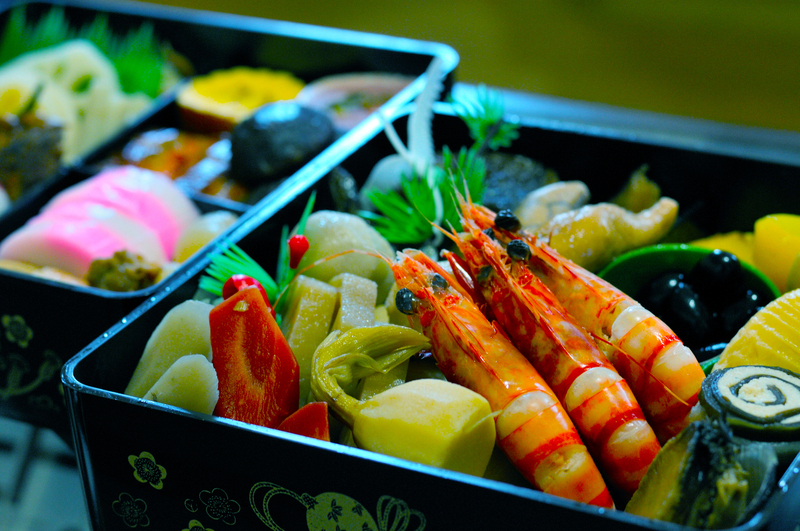 Compared to haute cuisine, fusion food is thought of as a relatively new concept. As a modern concept, it became fashionable in the 1970s but as a basic concept, it has been around for millenia. Fusion cuisine is basically marrying different styles and techniques, something that has been done with every migration since the beginning of time. One example of this is spaghetti, which is thought to have been inspired by the exposure of Italians to Chinese noodles. In India, this is apparent with the inclusion of tomatoes and chilli into the cuisine after these ingredients were introduced by the Europeans. Where haute cuisine is classic and follows certain techniques and recipes, fusion cuisine is more forgiving and fluid. Chefs need not follow the rules and service need not be in courses. One of the first chefs associated with fusion cuisine is Richard Wing who combined French and Chinese cooking, and later Wolfgang Puck who cemented the idea of Eurasian cuisine. Fusion cuisine requires a solid knowledge of a variety of techniques and ingredients, and a particular affinity for good flavour combinations. It means knowing whether elements like garlic and passionfruit could work well together. Fusion cuisine has received some heat from chefs who dismiss it as a confusion of styles and elements. 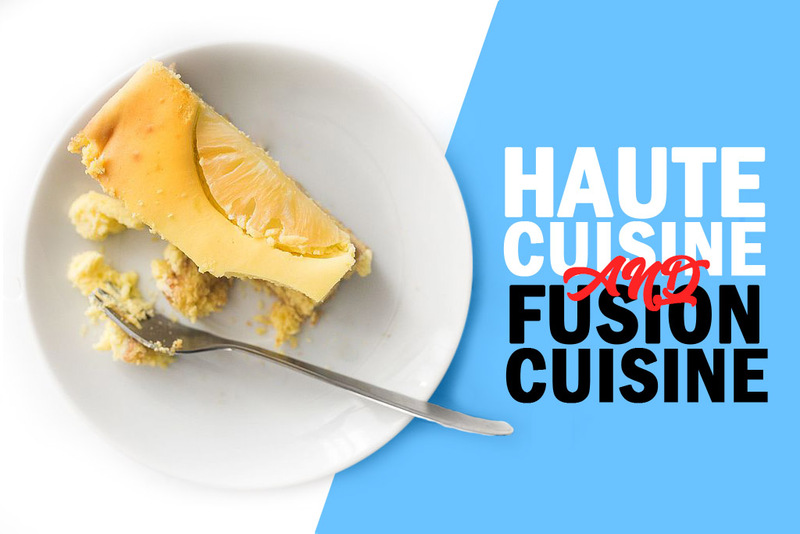 However, despite this, fusion cuisine remains popular and the simpler recipes possibly cheaper and easier to recreate at home compared to haute cuisine. As competition gets stiffer, food companies are bringing more innovative fusion cuisine ideas to the mix. One new style that has caught on recently is the food mash-up, combining two food types into one. This has spawned creative dishes such as the Cronut – pastry chef Dominique Ansel’s croissant-donut recipe which looks like a donut but is made with croissant-style dough and is filled with cream. Others include the ramen burger with a ‘bun’ of fried ramen noodles, fruit sushi, pastrami egg rolls, the mac n cheese pancake sandwich and tandoori chicken bruschetta. This entry was posted in Chef Jobs, Cuisine, The Galley on November 10, 2018 by admin. Congratulations to our ACCLA Students on successfully clearing their Cruise Interviews and all the best for their future ahead. Cruise ship chefs jobs don’t always have to involve toiling away in a galley below deck, wondering about the delighted faces of guests who enjoy your food. Today’s travelling demographic often includes guests who enjoy culinary experiences – not just indulging in it, but also learning more about what they eat. Cooking classes and demonstrations are among the popular activities guests like to engage in while on board. These include private classes or small group lessons of around five to 10 where guests can share one-on-one experiences with chefs, understand more about technique, and take away memories of great food and new recipes. Many cruise ships offer classes with celebrity chefs, but they are not always available on board. Displaying good cheffing skills, warm yet professional behaviour and in-depth knowledge of the culinary arts can land you a cooking or demonstration class. Azamara cruises, for example, gives cruise ship chefs a chance to teach interested guests how to make sushi or sashimi and whip up their favourite risotto. On Crystal Cruises, the excursions team schedules complementary food-themed tours in port, so guests can connect what they learn with you on board to the food they eat on land. On Holland America, private cooking classes allow guests to understand the secrets of great pesto and making the perfect jerk chicken, even as celebrity chefs lead demos at regular intervals. 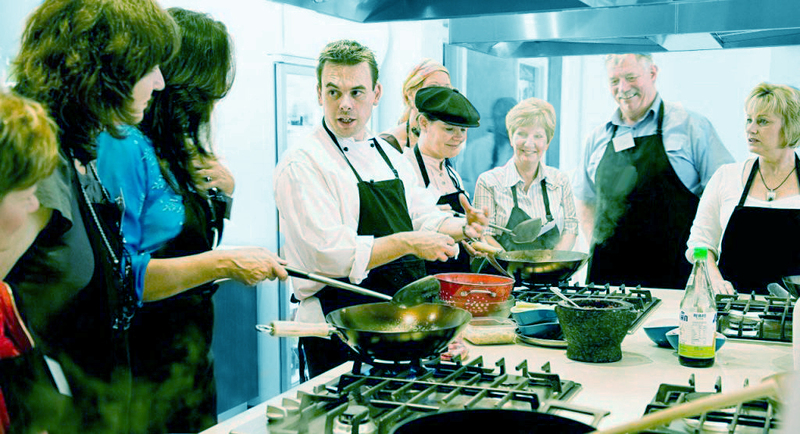 Exclusive cooking classes, which are more often than not priced in the top range, are coveted by guests eager to learn specific techniques and skills used by those in celebrity chef kitchens. This would mean passing on knowledge learnt as part of the team upholding the reputation of the celebrity chef on board. It’s a big responsibility. A variety of river cruises specializing in unique culinary experiences for guests are joining the bandwagon. Owing to their courses, often focusing on the Mediterranean region, the vessels make port often, allowing cruise ship chefs to take guests opting for their exclusive cooking classes ashore to source ingredients. Scenic Cruises, for example, has remodeled its dining rooms on board the Scenic Diamond, Scenic Sapphire and Scenic Emerald to house new private cooking emporiums. This space boasts cooking stations, cheese and wine cellars and audio-visual screens for up to 10 guests to easily view the cooking instructions from the chef leading the class. Similar cruises with exclusive cooking classes see cruise ship chefs head ashore with the guests to source local ingredients such as conch in the Bahamas or Bordeaux chocolate in France, head back on board and show participants how to cook with them. In a similar vein, cruise ships are also offering classes on wines and their pairings, with in-depth knowledge to guests on everything from appropriate glassware to grape origins. The Queen Mary 2 launched its Carinthia Lounge, which has a Wine Academy – a space where the chief sommelier and the wine team lead exclusive classes on various topics, regional tastings and producer workshops. Being a good cruise ship chef can open a mine of opportunities even on board, so you can try something different through the course of your time at sea. 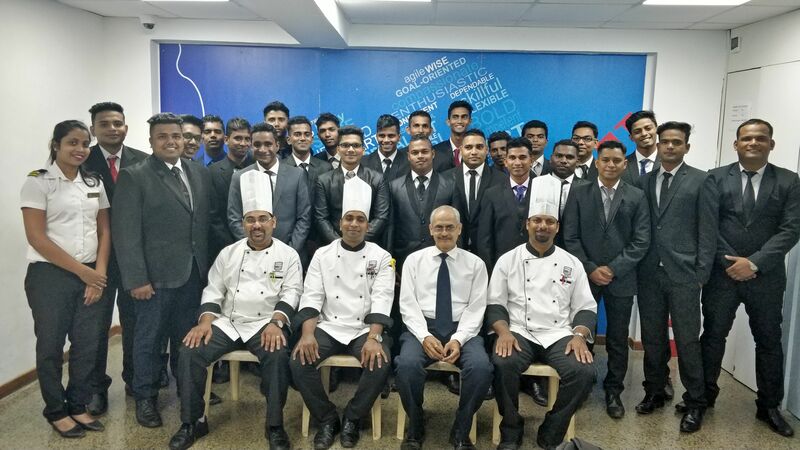 This entry was posted in Chef Jobs, Cruise Life, The Galley and tagged ACCLA India, ACCLAindia, live cooking, Show off Your Skills As a Cruise Ship Chef on October 13, 2018 by admin. Cruise ship chefs jobs involve cooking delicious food for thousands of people at least three times daily. This does not take into account snacks like fries, ice creams and cookies spread out over the course of the day. With so much food being prepared, there is bound to be wastage. In recent times, cruise ship companies have received negative attention for food wastage. However, in any commercial kitchen, it is difficult to completely eliminate waste as much of this depends on the consumer. If a parent orders a side of vegetables for their fussy child who either eats very little or does not touch it, the dish must be thrown out. But wastage is not just bad for the environment, it is also bad for the bottom line. Reducing kitchen waste can save the company a lot of money. Food waste on cruise ships has been estimated to be as much as 30 per cent, so making changes in house can help a great deal. One of the easiest ways for cruise ship chefs to reduce wastage is awareness. 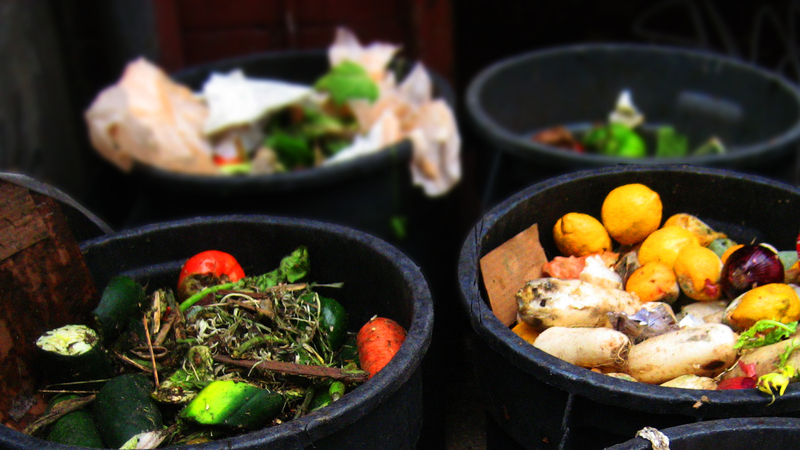 Understanding the impact of food leftovers and other waste can help them look at how they store and prepare their dishes differently. For example, they can reduce the amount of mass that gets cut off along with the head of a vegetable such as carrots or turnips. It also helps for chefs to use specialised equipment when cooking. Using paring knives to skin fruit or fillet knives to clean and debone fish allow them to execute the job properly, with minimum wastage. Similarly, using spatulas when transferring food or ingredients from one utensil to another also helps reduce the amount going into the bin. Food that perishes quickly must be used and stored smartly. The provisions manager assesses the amount of produce required for the days before the cruise ship hits port again and stocks accordingly. Cruise ship chefs must ensure they use the most ripe fruit and vegetables first so they do not go bad. Those that are slightly overripe can be used in recipes that require them, such as jams and preserves, pickles, soups and stews and even ice cream. Dry bread is very often to make toast and breadcrumbs. Sometimes, cruise ship chefs can get innovative to reduce wastage. Daily specials are a great way for them to use up food that has already been cooked but not served. Leftovers of the same day like rice can be used to make rice pudding or Asian-style fried rice. Grilled meats and fish have a variety of uses including club sandwiches, soups, wraps, tacos, pot pies and more. Still, it is important for cruise ship chefs to try and cut wastage before food is prepared. One way to do this is learning about how each person moves in the kitchen. 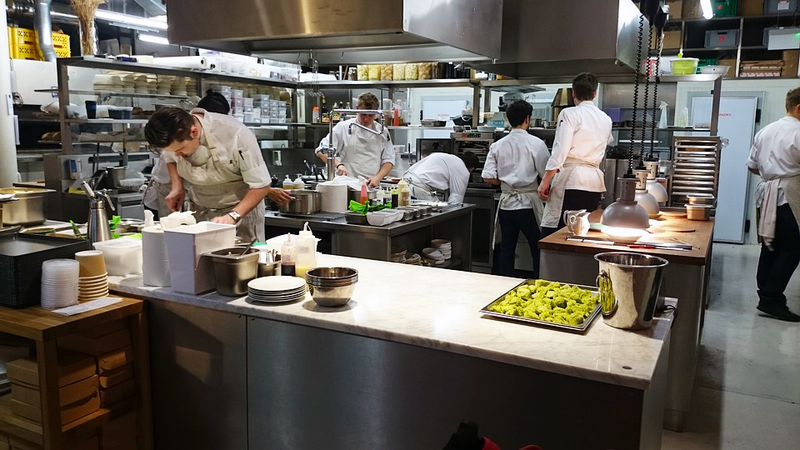 Training sessions allow the entire food and beverage staff to understand the rules of movement in a galley. This means that people in a particular position follow a certain pattern of movement in their work. This not only increases efficiency but also reduces any unintentional bumping that might cause spillage. Additionally, it helps to store cooked food correctly. For example, storing new batches of mayonnaise to the right of the fridge and older ones to the left increases the chances that the older ones will be used first, particularly when cruise ship chefs are in a rush and don’t have time to read use by labels. During service, some cruise ships use smaller plates to reduce portion sizes, particularly at all-you-can-eat buffets where guests are more likely to fill up their plates whether they are hungry or not. When serving heavy food such as rich desserts or thick sauces, serving sizes can be reduced to a more appropriate amount. Food wastage is a vital issue that many cruise ships are trying to tackle to not only help the environment but also reduce financial losses. This entry was posted in Cruise Life, Cruise Ship Jobs, Cuisine, The Galley on October 6, 2018 by admin.